The Advance Center is located on a 24 acre property in the Okanagon Highlands in the historic ghost town of Molson. The property has a two acre pond and beautiful mountainous views. Training programs are facilitated from within The Inn at Molson, a Bed & Breakfast operated on the property. 2011-2012's goals include increasing program frequency, adding a variety of courses, expanding and growing the membership, and breaking ground on property enhancements. MEMBERSHIP: Our membership database is currently being updated, Upon completion, we anticipate the numbers will near 500. FITNESS TRAIL: We believe a sound body supports a sound mind and spiritual well being. When you have these three things, maintaining and enhancing relationships become quite a bit easier. Because of this, in 2011 we'll be charting out a one mile fitness trail/loop on the property. The fitness trail will be incorporated into many of our educational and team building programs and seminars. There will be eighteen exercise stations along a one mile jogging path. (Map coming soon) There will also be a horseshoe pit and volleyball court. Station locations will also serve as areas for individual/family picnics, barbeques and overnight camping areas. The first and last stations are for stretching to reduce the chance of injury, while the rest help build strength and endurance. 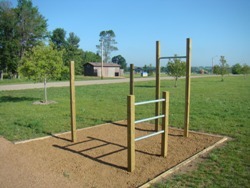 Use it for an individual workout or some family fun. Either way, you'll be helping your body and getting some fresh air! LODGE PROJECT: Currently, training programs are facilitated from within the Bed & Breakfast where attendees are limited to a capacity of three overnight couples at a time and maximum group size of twenty. The lodge project will launch the expansion of facilities to accomodate ten additional overnight couples/familys in a conference center building that will accomodate a group of two hundred people. Ground breaking will begin soon. Find out how you can help! ABOVE: View of potential building site # 1. This location is East of the Inn and has a southern view of the pond. The property line goes all the way to the south end bordering the road, just south of the two acre pond.